By Regina Villiers. Originally published September 28, 1994 in The Suburban Life, added January 16, 2019. 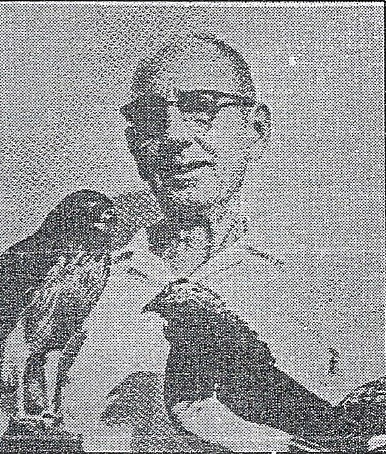 Jacob Foxbower with some of his mounted birds from his museum. Madeira today has many small specialty shops and businesses, including my favorite place to hang out, the Bookshelf. Whether you read, quilt, knit, eat fish, do plants and flowers or other activities, there’s something to whet your interest. But his is nothing new. Madeira has always had its small businesses, some of them quite unusual. At one time Madeira had its own taxidermist, Jacob Foxbower. Foxbower grew up on a farm in Pleasant Plain. When he decided that he wanted to be a taxidermist, he enrolled in a mail order taxidermy course from the Northwestern School of Taxidermy. He opened his first shop in Blanchester in 1934 and moved it to Morrow two years later when he got married. He moved his shop to Madeira in 1940 in the building now occupied by Joseph’s Hair Designs and Romauldo’s. Foxbower built this building, known as the Foxbower building. Dallas and Doris Burton both remember Jacob Foxbower and his shop when they were growing up. Doris and her family lived in back of the Foxbower building when it was being built. She remembers the shop and that he had on display in his shop a mounted two-headed calf, which was billed as having lived over six hours after its birth. He also had an albino opossum, which he had mounted as a teenager back on the farm. His main interest was always birds. His biggest business in the beginning was mounting pheasant from Ohio’s cornfields. But he did do all small animals and birds, as well as fishes and deer heads. He built up a large collection of birds, containing many rare specimens, which he obtained by buying and trading for study skins from schools, museums, and biologists all over the world. Study skins were dried and preserved by collectors in the field, but not mounted in a lifelike position. They usually had their bodies filled with cotton or excelsior to hold the shape of the feathers. The government later stopped the trading and selling of migratory bird skins. Jacob Foxbower kept his taxidermy shop on Miami Avenue until 1955 when he moved to Orlando Fla. In 1960 he moved to Weeki Wachee Springs, Fla., about 50 miles north of St. Petersburg, where he opened up a taxidermy shop and a large museum known as the Foxbower Wildlife Exhibit. He became known as the “Bird Man” and became quite famous for his bird collection, which contained many rare specimens. He had an Argus pheasant from the Malay Peninsula, a huge bird nearly as large as a peacock and having extremely long tail feathers. He also had an eared Manchurian and the dark and iridescent Impeyan pheasant. After he moved to Florida, Foxbower did lots of fish mounts, but his main interest continued to be birds. He was quoted as saying that his toughest job ever was the mounting of an elephant’s head. The largest full mount he mad was a bear, and the smallest was a shrew. A few years ago, the Burtons crossed paths with the Foxbowers again-through sheer coincidence. They were driving to Florida on one of their regular trips to the Sunshine State, when the Foxbower Wildlife Exhibit loomed ahead. They looked at each other. “Could it be?” They asked instantaneously. They stopped, and it was. Even the two-headed calf was there, still being billed as the star attraction, as was the albino opossum. But they discovered that Mr. Foxbower had died. Mrs. Foxbower was in ill health, but she and her son were still running the museum. Doris and Dallas visited with them and toured the museum. They were amazed at the immensity of it and how well kept the animals were. They were displayed in dost proof cases faced with huge sheets of glass. It has been said that the taxidermist may become as extinct as the Dodo bird, with the environmental controls that are in effect today. But for many years, Madeira had its very own, right here on Miami Avenue.